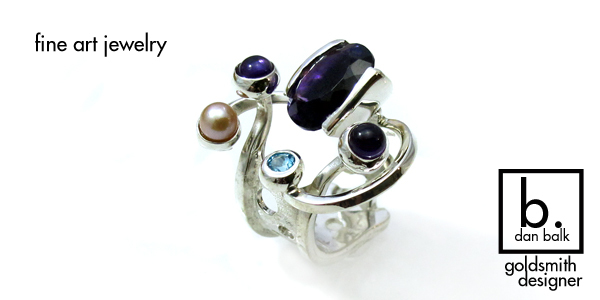 Silver Jewelry Making Classes are taught by artist and designer goldsmith, Dan Balk. Dan is enrolling beginner students, hobbyists, and the artistically adventurous to hand make jewelry in sterling silver in our 1-Day classes. Students discover new abilities to design and create their own piece of jewelry under the guidance of a professional jeweler. Dan Balk, has opened his jewelry studio for basic silversmithing classes 7 days a week. Monday – Friday from 9:00AM to 1:00PM, Saturday and Sunday from 10:00AM to 2:00PM. No experience is needed. *Reservations are required. Each class is approximately 4 hours long. Each class is private, one-on-one learning. Students learn about jewelry in Dan Balk’s fully equipped jewelry studio. In the jewelry making classes, students will develop hands-on education in hand fabrication using raw materials. Students will gain awareness and practice in shop safety, design, creating silver sheets and wires, metal cutting, soldering and forming, and stone setting. Dan’s classes focus on projects that students can complete and develop confidence. Classes include all supplies, materials and tax. *additional gemstones cost more. The total for the 5 day private jewelry workshop is $1,375.00. A $50 non-refundable reservation check or credit card is needed to reserve each class date. The balance is due on the date of the class in cash or C.C. (*no checks are accepted on the class date.) You can make 1, 5 or 10 scheduled payments. Some students may choose to take a class twice to practice and enhance their skills and techniques in a specific area. Advanced Private Classes are available. Students must submit 3 clear photos of your current work via text email. Include what techniques or skills you would like to practice, learn, or enhance. For more information call Nataly Balk at (813) 728-4325.